Mkono Artificial Calla Lily with Decorative Vase Set 3Pcs Faux Silk Calla Lily Flowers Floral Arrangements for Home Kitchen Office Wedding Decor, White by Mkono at Home Decor Outlet Store. MPN: JJDDHP002. Hurry! Limited time offer. Offer valid only while supplies last. The Silk Floral Arrangements tucked away in an adorable glass vase, This beautiful arrangement is the perfect size for a counter, desk or side table. The Silk Floral Arrangements tucked away in an adorable glass vase, This beautiful arrangement is the perfect size for a counter, desk or side table. No maintenance and no water is required, this arrangement will retain its beauty for a lifetime.Great for office, family garden, balcony garden, household decoration. Let your place decorates a more elegant feeling. Brightening up your kitchen windowsill, or adding a touch of organic appeal to your living room, this faux calla lily arrangement brings the timeless beauty of nature to your home. 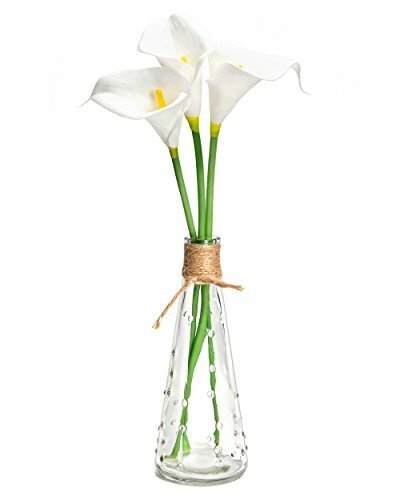 Crystal glass vase with rope, is the perfect size for a counter, desk or side table. Ideal for creating a romantic setting, and also makes a great gift. Set include 3 artificial calla lily and a vase. Size: Height 12". Mkono is a registered trademark and our product is professional manufacturing and sole selling.